What is an ACT WorkReady Community? ACT® Work Ready Communities are areas where ACT® WorkKeys® and the National Career Readiness Certification® is earned by current, transitioning and emerging workforce and recognized by employers. 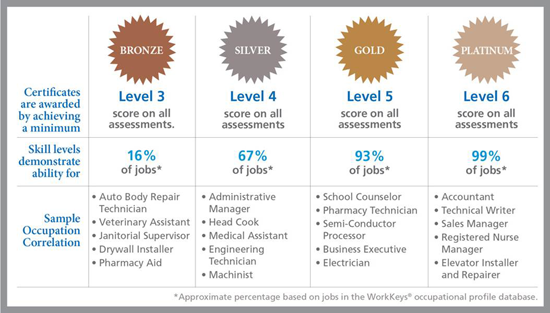 The ACT® WorkKeys® NCRC® is a portable, industry-recognized credential that clearly identifies an individual’s WorkKeys® skills in workplace documents, applied math and graphic literacy - skills required for 77 percent of jobs based on ACT JobPro database. Currently, over 20,000 employers recognize the ACT ® WorkKeys ® NCRC ® in the Unites States. M. Larry Richard, Iberia Parish President remarked that parish government has passed a resolution in support of the Work Ready Communities Initiative and is excited to have this asset which will help to better describe the skilled workforce of Iberia Parish to site selectors and business developers around the country. New Iberia Mayor, Freddie DeCourt said, "The Work Ready Communities Initiative is another tool to help illuminate how business and education in New Iberia work together to build stronger community."